Solar Energy offers a clean and environment friendly energy solution. 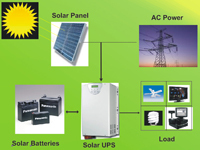 Solar Energy is used to produce the electricity for hybrid and standalone power requirements. Makkays brings you Japanese technology and a specialised range of Solar products which are tested, reliable and economical. These products are easy to install and environment friendly. Makkays has in-house technical expertise and offer ready made solutions as well as customised Solar Power Solutions to meet your requirements. Short term return on investment. Solar systems are ideal as an ‘on-site’ source of power. Reduces dependency on grid supply which may not be available in remote locations. Saves investment & maintenance costs on UPS/Genset or any other source of power required otherwise. Fit for water supply applications in the remote locations. Feeding your household & industry needs. power from the sun pours onto the panels and down to the inverter which perfectly synchronises your home and grid power needs. Maintenance-free, and with an expected life of over 25 years. Each of below mentioned product would be supplied with solar home UPS, Solar panel, Batteries and 5 meters each AC & DC cables. Typical backup time once the batteries are 100% charge is 02 hours. Long backup time units (up to 24 hours) are also available. MAK-6048-2 8 Energy Savers, 6 Fans, 8 Tube Lights, 1 TVs, 1 PC with 19" Monitor, 1 Refrigerator 12Cu. Ft.
Load Calculation Chart is for reference purpose only. Please consult our technical team for proper load calculations.